Buckle those seat belts when traveling through the Town of Mountain View! The Denver Post recently published an article describing the alleged revenue raising procedures of the Town of Mountain View. The town is allegedly singling out drivers for not wearing their seat belts, pulling them over, and citing them -even when there is not other violation of law. In Colorado, seat belt violations are non moving violations, carry 0 points against your license, and the fine is set at $100.00 -according to state law. 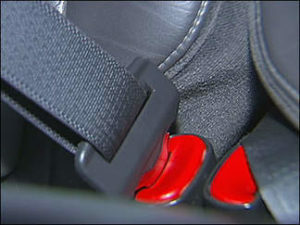 People Don’t usually contact Denver Traffic Lawyers to fight tickets like the ones issued in the Town of Mountain View for seat belt violations because they have very little impact on the person who receives them. Most people who contact Traffic Attorneys in Colorado are fighting to keep their driving records clean, insurance rates low, and to keep the government honest. If you have been cited with a traffic citation, you are innocent until proven guilty. In some cases you are allowed a jury trial and other times it is a trial to the judge. Maybe you are reading this blog because you are holding a ticket from the Town Of Mountain in your hands and want to fight this ticket. Maybe you should. Ike Lucero, Jr., is a Traffic Lawyer that handles traffic cases in the Denver metro area and throughout Colorado. Feel free to fill out our web submission form or call to set up a consultation (303) 963-9363.